A man and a wavy-haired woman stand in the foreground. A curly-haired woman stands further back in the background. Man: Tell me your cute friend's full name. I'll Google her. The next panel shows the wavy-haired woman and the curly-haired woman. 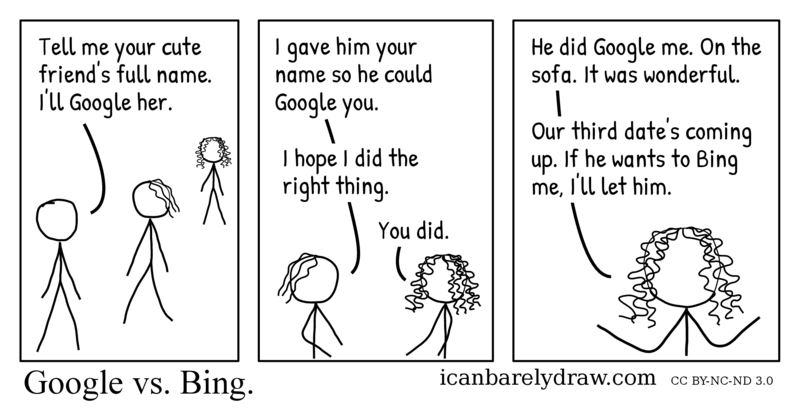 Wavy-haired woman: I gave him your name so he could Google you. Wavy-haired woman: I hope I did the right thing. The third and final panel shows only the curly-haired woman in a close-up view. Her hands are bent outward and upwards. Curly-haired woman: He did Google me. On the sofa. It was wonderful. Curly-haired woman: Our third date's coming up. If he wants to Bing me, I'll let him. And all this time I thought googling yourself meant the other thing!